[This tutorial has been written for answering a stackoverflow post, and has been used later in a real-world context]. 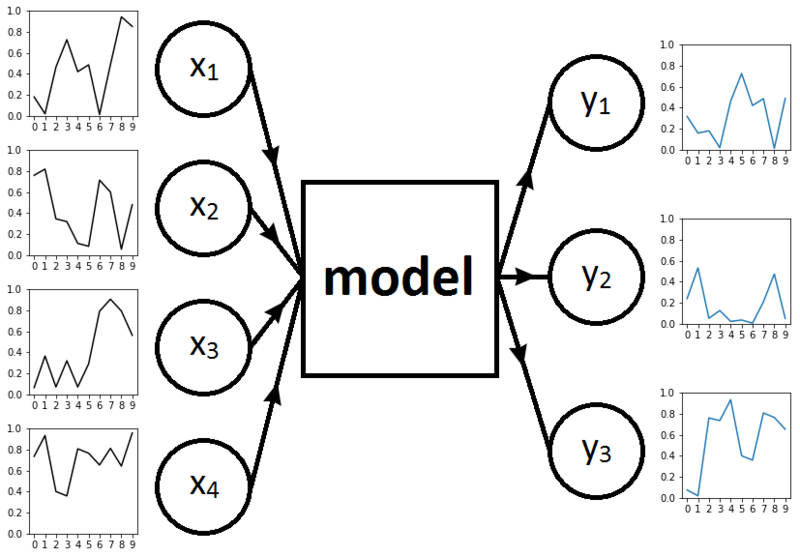 This tutorial provides a complete introduction of time series prediction with RNN. In part A, we predict short time series using stateless LSTM. Computations give good results for this kind of series. 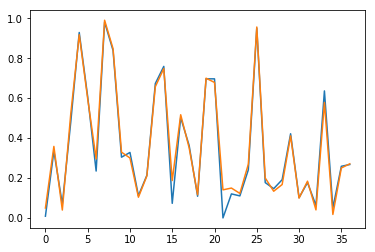 In part B, we try to predict long time series using stateless LSTM. In that case, model leads to poor results. In part C, we circumvent this issue by training stateful LSTM. 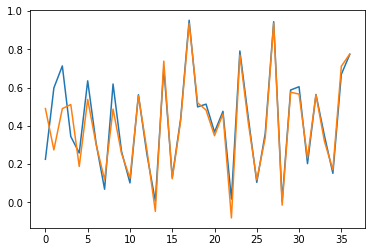 Stateful models are tricky with Keras, because you need to be careful on how to cut time series, select batch size, and reset states. I wrote a wrapper function working in all cases for that purpose. In part D, stateful LSTM is used to predict multiple outputs from multiple inputs. Companion source code for this post is available here. We focus on the following problem. 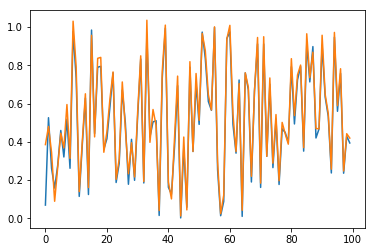 Let four time series following the uniform distribution on . Each time series is indexed by . Each time series is also indexed by (first undefined elements of are sampled randomly). Our task is to predict the three time series based on inputs . To this end, we will train different RNN models. Fig. 1 represents the framework when . Two parameters are used to define training and test sets: the number of sample elements and the length of each time series. Each sample element consists of inputs (four time series of length ) and outputs (three time series of length ). We take the same number of elements in the training and the test set. For example, is the value at date of the time series , which is the second input of , which is the -th element of the training set. This is implemented in function sample_time_series_roll. We consider short time series of length and sample size . In this part, the most difficult task is to reshape inputs and outputs correctly using numpy tools. We obtain inputs with shape and outputs with shape . 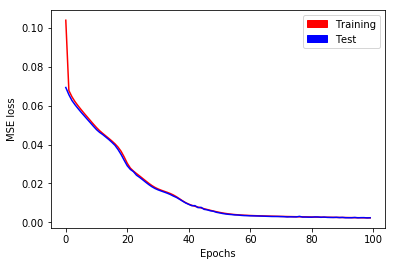 Then, an classic LSTM model is defined and trained with units. Training performs well (see Fig. 2), and after epochs, training and test losses have reached . Conclusion of this part: Our LSTM model works well to learn short sequences. We consider long time series of length and sample size . Note that product is the same in parts A and B (so computation of epochs takes a similar amount of time). 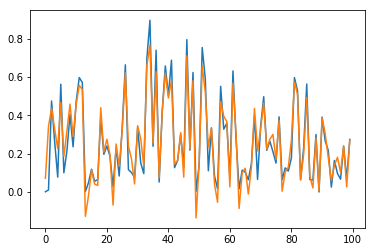 We repeat the methodology described in part A in a simplified setting: We only predict (the first time series output) as a function of (the first time series input). Even in this case, predictions are not satisfactory after epochs. Training and test losses have decreased to (see Fig. 4), but it is not enough to give accurate predictions (see Fig. 5). In Fig. 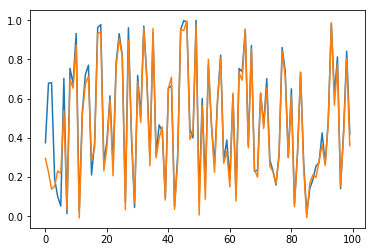 5, we check output time series for sample and for the first elements (blue for true output; orange for predicted outputs). Conclusion of this part: Stateless LSTM models work poorly in practice for learning long time series, even for . The network is able to learn such dependence, but convergence is too slow. 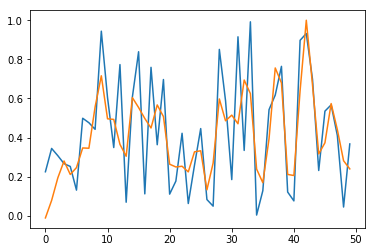 In this case, we need to switch to stateful LSTM as seen in part C.
We have seen in part B that learning with LSTM can be very slow for long time series. A natural idea is to cut the series into smaller pieces and to treat each one separately. An issue arises by applying this method directly: Between two pieces, the network will reset hidden states, preventing share of information. For example, with and a series cuts into pieces, the first element of piece cannot access to any information kept in memory from piece , and will be unable to produce a correct output. Here is coming stateful LSTM. We cut the series into smaller pieces, and also keep state of hidden cells from one piece to the next. This is illustrated in Fig. 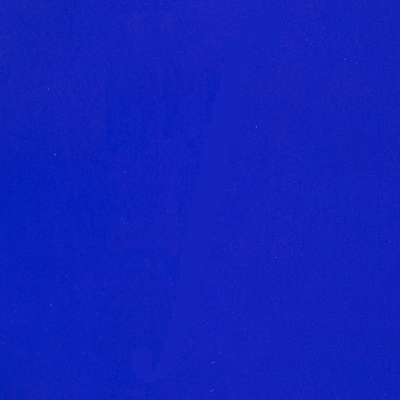 6 with a series of length divided into pieces of length . In practice, we also need to pay attention of the batch size during cut. The easiest case is when batch size is the number of elements in the sample. In that case, we only reset states after each epoch. Another simple case is when batch size is . In that case, we present each series in a lineup, and reset states after each series. This case is illustrated in Fig. 7. The tricky case is when and . In that case, we present a cut batch series in a lineup, and reset states after a complete batch series. This is illustrated in Fig. 8. In the companion source code, cut is done with stateful_cut function, designed to manage number of cuts, batch size, as well as multiple inputs and outputs. We consider long time series of length and sample size . We select and . Consequently, we have: . After cut, we obtain inputs with shape i.e. , and outputs with shape . 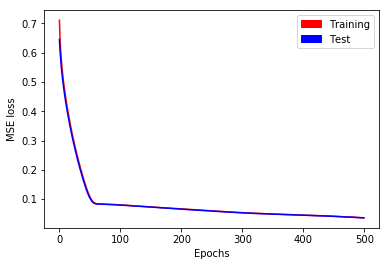 A stateful LSTM model in defined with units. For the training part, a callback has been written to reset states after pieces (function define_reset_states_class). However, this callback is not properly called with validation data, as noted by Philippe Remy on his blog. Another function define_stateful_val_loss_class has been defined for that purpose. Also, we need to take shuffle = False during model fitting. On the whole, training is performed during epochs as written in the following sample code. Training and test losses have decreased to (see Fig. 9). Prediction with stateful model through Keras function model.predict needs a complete batch, which is not convenient here. Instead, we write a mime model: We take the same weights, but packed as a stateless model. 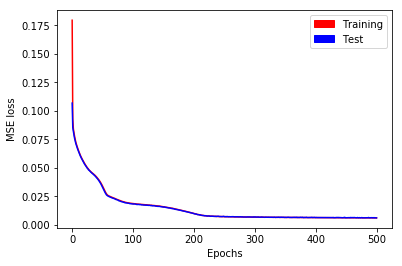 Conclusion of this part: Our stateful LSTM model works quite well to learn long sequences. 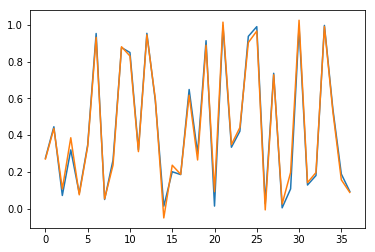 To deal with part C in companion code, we consider a 0/1 time series as described by Philippe Remy in his post.